Today is Ada Lovelace Day, a celebration of women in tech. Ada was a mathematician and the world’s first programmer; in the mid-19th Century she wrote technical documentation and programs for Charles Babbage’s Analytical Engine. This year, Suw Charman-Anderson made a pledge: “I will publish a blog post on Tuesday 24th March about a woman in technology whom I admire but only if 1,000 other people will do the same.” Over 1,800 people agreed, and so here you are. Dyson attended Harvard at the age of 16, was reporting for Forbes at 25, and was analyzing technology stocks for Wall Street by the age of 30. She co-established the publication Release 1.0, which continues today as Release 2.0 and sells for $130 a single issue. She has backed some of the best start-ups online, including Flickr, del.icio.us, and many others. She was chairwoman of the Electronic Frontier Foundation and boardmember of the Long Now Foundation, blogger for the Huffington Post, and columnist for the New York Times. 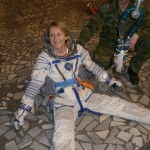 At the time of my writing this, Esther Dyson is living just outside of Moscow, training to be a cosmonaut. The first time I saw Esther Dyson speak at SIME it really struck me that she was an extrordinairy entrepreneur, a businesswoman investing early in eastern european countries, investing and engaging in start-ups, a philantopist, and an visonairy and brave adventurer, that dares to walk her own way. Ms Dyson started her working life at the bottom of the heap as a fact checker at business magazine Forbes, only because Variety would not hire her. It was not long though before she became a reporter writing about technology. After a few career moves, she bought the company she worked for and took over a highly influential newsletter called Release 1.0 that covered emerging markets. “What I did for a long time was make things obvious that people weren’t noticing by explaining what was going on and pointing out stuff like the internet or the impact the internet would have,” said Ms Dyson. I first heard of Esther when I was evaluating whether to work for Eventful; she and Steve Jurvetson were both early-stage investors in the company. I learned more about them through their Flickr photos, and it became obvious that they were both space and science enthusiasts as well as savvy tech investors. That implied good things about the company, so I joined up. Seeing the faces of heroes like Peter Diamandis in her photos gave me the impression that the space industry is actually a pretty small group, and her roll-up-the-sleeves style of participatory journalism made their amazing activities seem within reach. Her enthusiasm for getting involved and her willingness to work hard have inspired my own gung-ho approach to space advocacy. 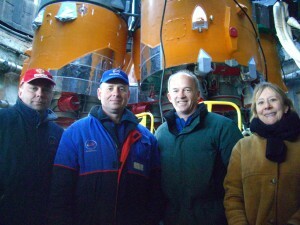 Today she’s posting photos from a Soyuz rocket rollout, attending as a member of the backup crew. She has shared every step in the process, writing not as some rich or famous tourist but as an excited traveller sharing with the folks back home. And that’s what it really comes down to: Esther Dyson isn’t just an amazing “woman in technology.” She’s an amazing human being.